An extendable tool box includes a tool box, a table top and support legs. The tool box may be slidably reciprocated along a first horizontal travel path aligned parallel with the truck bed. The table top may be contiguously oriented parallel with the tool box and slidably reciprocated along a second horizontal travel path registered parallel to the first horizontal travel path. The tool box may include a bottom surface having a cavity whereby the table top may be stowed. A sliding mechanism may be connected to the bottom surface of the tool box and may permit the tool box to freely reciprocate along the first horizontal travel path. The support legs may be telescopically adjustable between extended and retracted positions. The tool box may include a plurality of storage compartments arranged on left and right longitudinal sides and equidistantly offset along a central longitudinal length of the tool box. This is an extendable and removeable full tool box (not just a slideable platform ) that fits flat and on rails in back of a pick up truck. You lift the lock, slide it out to get your tools and other things. you can put the front legs down for support and use it as a work bench. If you need to leave you can put the back legs down and leave it on site. It also has a slide out table on the underside. This is so you have a place to put your supplies instead of on top of the lids and having to move them each time. The buyers could be construction workers, tailgaters at sporting events, campers, hunters, the guy with a nice truck that does'n want a box that sticks up, or he has a lid. He can remove and put in his garage for move room in the truck bed. I'm open to either selling it or licensing it. I have just started marketing it. The potential for sells are the seventy million trucks in America and Canada, not to mention the military. I am working on securing a trademark name on it. 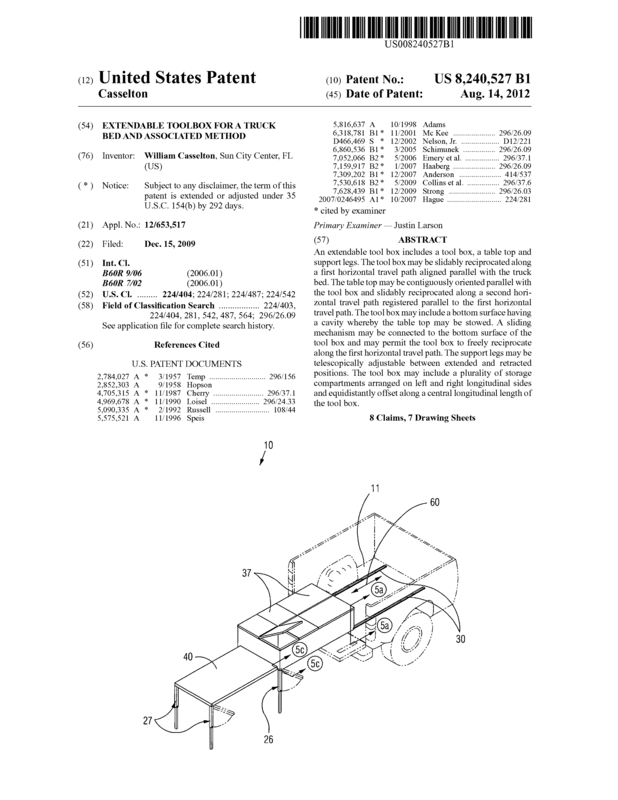 Page created at 2019-04-23 6:38:04, Patent Auction Time.